It has been a wild whirlwind over here for the last week and a bit. With the year coming to a close, the activity at the factory has been nonstop, as well as the action here in the house! Our final wave for 2013 is tentatively scheduled for Sunday, December 1st at 9:30PM EST. Everything is currently on track, but with the intense shipping across the globe right now, there is a small chance that the release date may get bumped a few days. I'm hoping that's not the case, but the holiday season can create roadblocks from seemingly out of nowhere. A full list will be up on Wednesday. 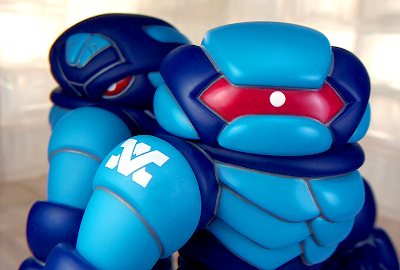 Over this entire week, we'll be posting up pics of this new round, which is paying homage to multiple classic toylines, with the most prominent being the Microman/Micronauts Giant Acroyear figure (which was a two tone blue with red accent parts). While studying the pantones of the old Giant Acroyear, I couldn't help but notice the parallels between the palette of GI Joe's Cobra and Microman's Acroyears. I've noticed the connection before, but when you get down to the details, the similarities are pretty neat. The big event for me personally in this wave is finally running a Red Metallic (with pearlescent additive) Argen, along with the rest of the molds. Nailing a proper Red Metallic has been a bit tricky, as too much metallic additive pushes the hue towards a grungier red base color, almost looking more crimson/purplish than a true red. Now that I have a few of these new Red Metallics in hand, I can safely say that they are a true red hue, akin to the Reydurran red we ran earlier this year. The pearlescent finish creates some vivid effects, which are of course very difficult to photograph! Overall I'm really excited to have another metallic/pearlescent color to add to the build catalog. I hope you guys are in the mood for some Red Metal! LOVE these colorways bro! Can't wait to see more pix!!! WOW!!! It's just great! 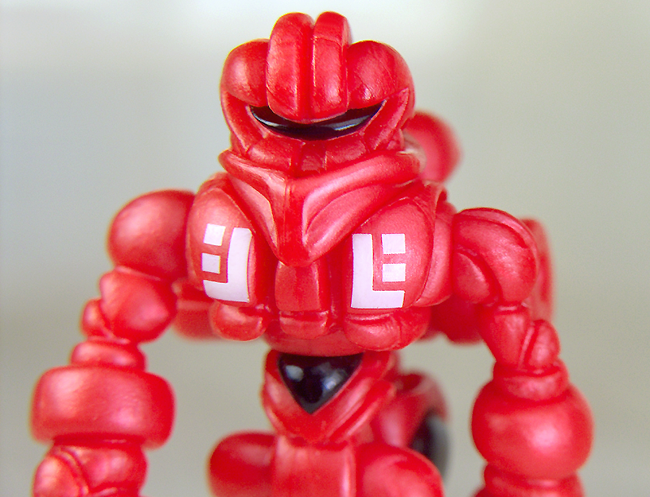 I am very grateful to you for such a great figure and the universe as a whole Glyos! Waiting for new pictures! Glad to see the ol' Armodoc head making a return! And with silver panel lines, to boot! I went nuts with the Reydurran drop, I'm ready to go nuts with this!!!!! Hopefully I can raise the scratch. That Buildman will definitely be mine. Man those Armodocs look sharp. I cant wait!! have a great thanksgiving and Christmas!!! Return of the Buildman -- yay! Was his absence due to a mold refurbishing? Please tell me the Armo/Syclodoc isn't one per order. WHOA! Both colors are looking pretty slick Matt, I think this may be the colorway where I finally add a Syclodoc to my collection. And yes they do seem very Cobra-esc in their color schemes; I guess red, dark blue & lighter blue are the colors of evil? O_o?? Excellent colors! So I take it that Argen "got better" from his little episode with Phanost last year?